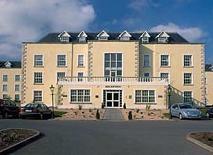 One of the few hotels in west Co. Dublin with a prime location for City West Business Park. The hotel is modern, spacious, bright and airy. Professional staff pay particular attention to personal service ensuring a wonderful stay at the Quality Hotel. The hotel is a unique combination of suites and guestrooms. Accommodation is comprised of seven separate buildings. There are 146 rooms and suites at the Quality Hotel. Suites make up two thirds of this accommodation. They offer the privacy of an apartment but they services of a 3 star hotel on your doorstep. Each suite has a lounge, dining area, small kitchen and bedroom. Standard guestrooms are all ensuite and equipped with the usual facilities including television, trouser press, hairdryer, telephone and Tea/Coffee making facilities. Lanningans Steakhouse has an exciting menu and is combined with a warm friendly atmosphere. They serve typical American Steakhouse food and also an International theme of dishes from around the world. The Hotel residence bar has wonderful views of City West Golf Course. Tea, coffee and light snacks as well as a range of beers and spirits are served throughout the day and evening. The hotel is situated 6 miles from Dublin City Centre and a 20 min drive from Dublin Airport. The M50 is a short distance away connecting Dublin to all major national routes. Ideal location for those visiting the City West Business Park.